A free information site for gay, lesbian, and LGBT visitors to Crete, Greece. Visitors to Crete get quite emotional about beaches, and wherever you stay someone is bound to tell you that you must go to this beach, or that beach. This is all very well but quite often visiting some of the beaches involves a journey of some hours there and back. This makes Crete an ideal place for travelling around and being adventurous and staying in more than one place. Perhaps the most famous beaches on the island are Vai, on the far east coast, Balos Lagoon on the north west top corner, Elafonissi on the south west bottom corner, Kommos on the south coast near Matala, and the beaches on Gavdos and Chrissie islands off the south coast. Many of the beaches have a 'clothing optional' area as naturism is quite popular with gay men, and if you are lucky enough to be driving around and finding a beach all to yourself then who is to say whether you wear anything or not? One of the best known nudist beaches on Crete is at Sarandari near Hersonissos, some actually call this 'the gay beach' but it is mixed. Other beaches where nudism is acceptable in some areas are at Karteros near Heraklion airport, Kommos, just to the west of he archaeological site, which also has a very popular area with trees and bushes at the top of the cliff, ideal for getting away from the heat of the midday sun. Sarandari (Hersonissos) Beach from the sea. 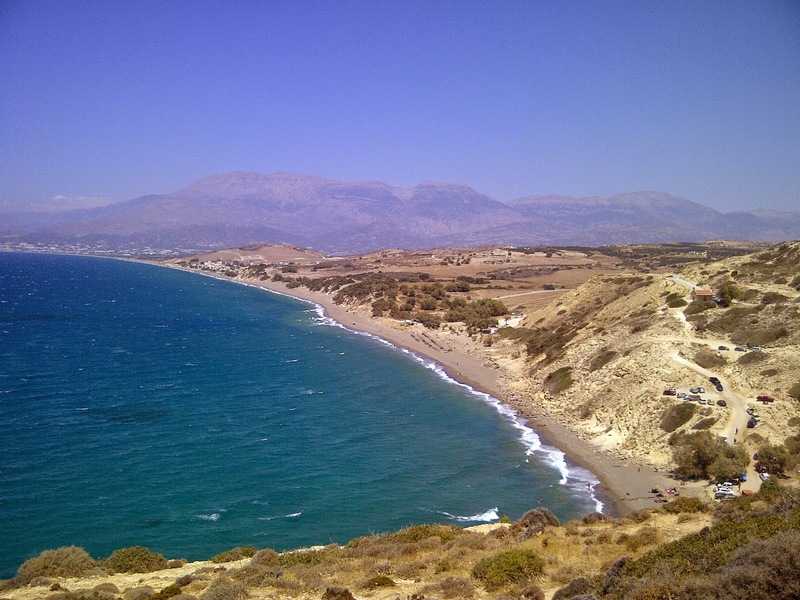 Georgioupoulis and Kalives to the west of Rethymno are also popular with naturists, as are Red Beach, also near Matala, and some other beaches on the south coast. Such is the attraction of Cretan beaches that some gay visitors come year after year to try and visit them all! There are a couple of web sites that you can research for the latest information but don't try asking them if there is a gay cruising area! Some beaches, like Vai, offer watersports. Crete also offers opportunities for more physical pursuits as there are a number of gorges, the most notable being Samaria, which are ideal for hikers, best visited early in the year when the weather is cooler and the wild flowers are in bloom. Some places also offer pony trekking trips along the gorges or just along the beach. Jeep safaris are also worthwhile if you want to see the wilder parts of the island not accessible by other means. Of course one of the best ways to get to see some things off the beaten track is to make friends with the owners of your hotel, get to know them well enough and they will happily take you to their 'village'! 2015 T. Mitchell. Ethereal theme. Powered by Blogger.